A girl goes on an epic journey through a bleak landscape in the first book of this post-Apocalyptic trilogy. Saba has spent her whole life in Silverlake, a dried-up wasteland ravaged by constant sandstorms. The Wrecker civilization has long been destroyed, leaving only landfills for Saba and her family to scavenge from. That’s fine by her, as long as her beloved twin brother Lugh is around. But when a monster sandstorm arrives, along with four cloaked horsemen, Saba’s world is shattered. Lugh is captured, and Saba embarks on a quest to get him back.Suddenly thrown into the lawless, ugly reality of the world outside of desolate Silverlake, Saba is lost without Lugh to guide her. So perhaps the most surprising thing of all is what Saba learns about herself: she is a fierce fighter, an unbeatable survivor, and a cunning opponent. She has the power to take down a corrupt society from the inside. Teamed up with a handsome daredevil named Jack and a gang of girl revolutionaries called the Free Hawks, Saba stages a showdown that will change the course of her own civilization.Blood Red Road has a searing pace, a poetically minimal style, violent action, and an epic love story. Moira Young is one of the most promising and startling new voices in teen fiction. A girl goes on an epic journey through a bleak landscape in the first book of this post-Apocalyptic trilogy. Saba has spent her whole life in Silverlake, a dried-up wasteland ravaged by constant sandstorms. The Wrecker civilization has long been destroyed, leaving only landfills for Saba and her family to scavenge from. That’s fine by her, as long as her beloved twin brother Lugh is around. But when a monster sandstorm arrives, along with four cloaked horsemen, Saba’s world is shattered. Lugh is captured, and Saba embarks on a quest to get him back. Suddenly thrown into the lawless, ugly reality of the world outside of desolate Silverlake, Saba is lost without Lugh to guide her. So perhaps the most surprising thing of all is what Saba learns about herself: she is a fierce fighter, an unbeatable survivor, and a cunning opponent. She has the power to take down a corrupt society from the inside. Teamed up with a handsome daredevil named Jack and a gang of girl revolutionaries called the Free Hawks, Saba stages a showdown that will change the course of her own civilization. Blood Red Road has a searing pace, a poetically minimal style, violent action, and an epic love story. Moira Young is one of the most promising and startling new voices in teen fiction. This is my first audiobook review and found one that I knew would be good. 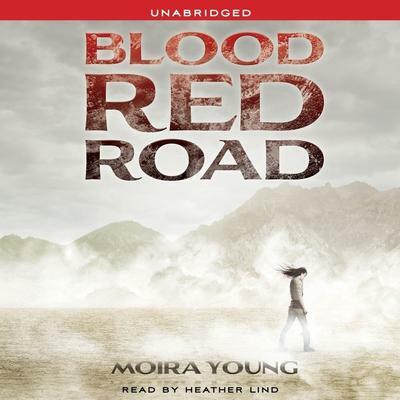 Blood Red Road and Heather Lind do NOT disappoint! It will be hard to find another as good as this.